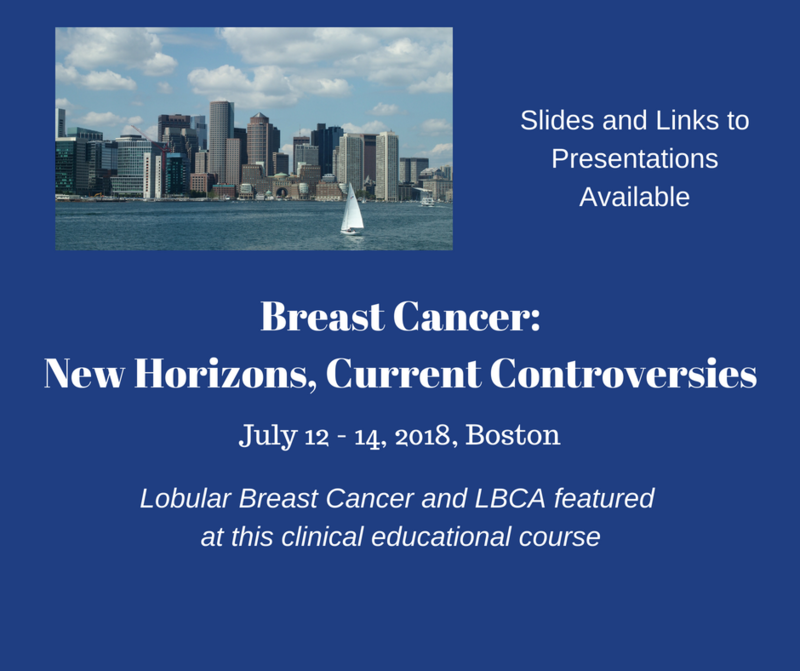 Lobular Breast Cancer (ILC) and the Lobular Breast Cancer Alliance was featured on the final day of Harvard Medical School’s annual comprehensive breast cancer educational course, Breast Cancer: New Horizons, Current Controversies in July 14, 2018 in Boston. ILC clinical education materials presented at this course are available. Presenters discussed ER+ Breast Cancer with a Special Focus on ILC, Imaging, Pathology and Surgery and Biology and Special Subtypes. Over thirty patient advocates attended the meeting from around the US and Canada. 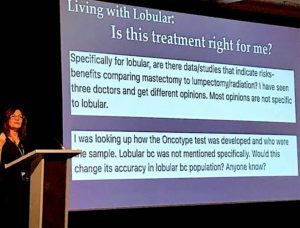 The Lobular Breast Cancer Alliance presented the LBCA Initiative, and conveyed the patient perspective of living with lobular breast cancer and suggested opportunities in the clinic that could benefit patients. Advocate Liz Frank presented on the Importance of Patient Advocacy in Clinical Research, a primer on how research advocacy improves outcomes for patients, and how patients can be involved. Learn more about Research Advocacy. LBCA hosted a meeting after the event to discuss ways to advocate for ILC. View the Advocacy Toolkit and Tips to Educate and Elevate ILC. Several presenters have generously made their slides available, which are linked below. Many thanks to the organizers of Breast Cancer New Horizons, Current Controversies and LBCA Scientific Advisory Board Member Dr. Otto Metzger for making this event possible.